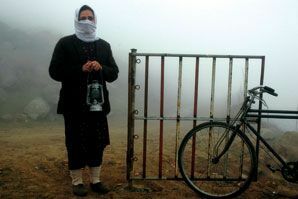 An hypnotically beautiful portrait of a widow and her ailing father, who live alone on a misty hillside and scrape a living by mending oil lamps and making charcoal. The film's elegant compositions and quietly powerful performances slowly envelop us in the widow's simple, poignant world. In its meditative rhythm and painterly long-take shooting, this exquisite debut recalls such masterpieces as Sohrab Sahless' Still Life or Sokurov's Mother and Son. An austere and mesmerising triumph. 'Part of the Edinburgh International Film Festival'.